The Pretty Reckless releases its new album Going To Hell next Tuesday, March 18th via Razor & Tie. It is currently on tour in Europe in support of its upcoming album. The band has reason to celebrate as it tours. That’s because its new single, ‘Heaven Knows’, has reached the #1 spot at Active Rock Radio. The song’s accompanying video, directed by Jon J and Taylor, can be viewed online now at http://veo.ly/GlreyE and http://www.youtube.com/watch?v=rHBxJCq99jA. The band is currently performing in support of Fall Out Boy. It will perform April 23rd at the annual Revolver Golden Gods Awards. From there, the band will be very busy throughout the summer. It will perform at a number of festival shows including: Rock on the Range, Rocklahoma, Monster Energy’s Fort Rock, Welcome to Rockville, Rock Fest Kansas City, and a number of others. The band’s most current tour schedule is available online at http://www.bandsintown.com/theprettyreckless. The track listing for Going To Hell is listed below. Leading up to the album’s pre-order availability, The Pretty Reckless has previewed four other songs from its upcoming album. The video for the album’s title track is available online now via YouTube at http://www.youtube.com/watch?v=bmtbg5b7_Aw&feature=c4-overview-vl. It already has 3.5 million views. A lyric video for ‘Follow Me Down’ is available online as well at http://www.youtube.com/watch?v=vfwJ-SoYw4U. A teaser video for ‘Burn’ and a fan-made lyric video for ‘Heaven Knows’ are also among the tracks previewed from the Going To Hell. More information on The Pretty Reckless, its upcoming album and tour plans is available online at http://www.facebook.com/theprettyreckless and http://twitter.com/TPROfficial. To keep up with the latest sports and entertainment news and reviews, go online to http://www.facebook.com/philspicks and “Like” it. Fans can always keep up with the latest sports and entertainment news and reviews in the Phil’s Picks blog at https://philspicks.wordpress.com. Organizers of the Fort Rock Festival have announced the details for the annual hard rock music festival. This year’s festival is scheduled for Saturday, April 26th. It will be held at JetBlue Park in Fort Myers, Florida. 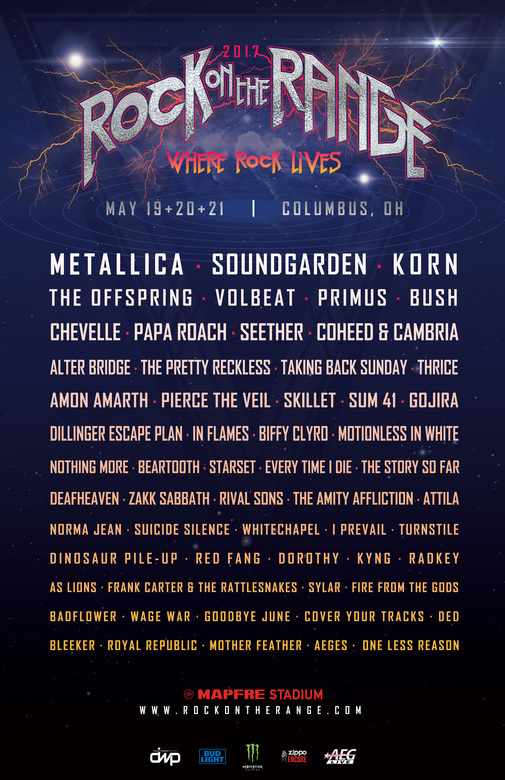 The list of this year’s performers includes: Seether, Theory of a Deadman, Black Stone Cherry, Sick Puppies, Trivium, Skindred, The Pretty Reckless, KYNG, Nothing More, Twelve Foot Ninja, and a bunch more. 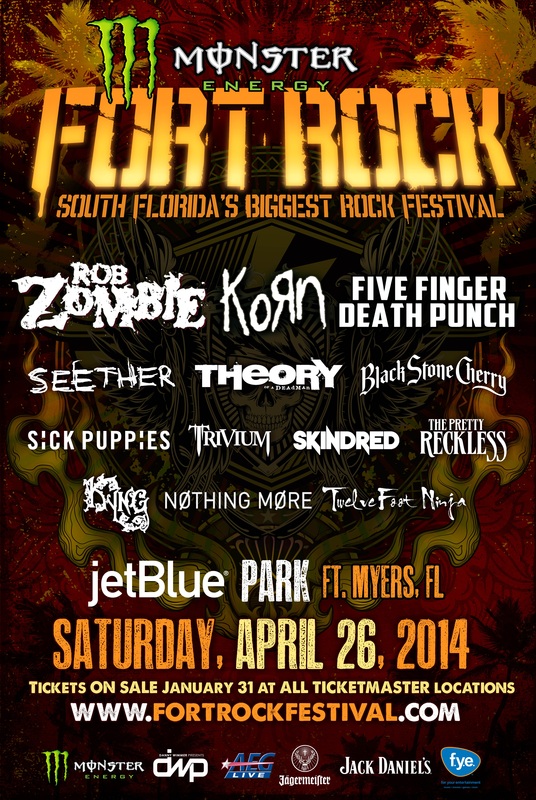 Veteran hard rock act Korn will share headlining duties at this year’s festival with Five Finger Death Punch. When asked about performing at this year’s festival (its second) 5FDP drummer Jeremy Spencer spoke on behalf of the band. He expressed the band’s excitement in being invited to headline the show and what it means to play along with some of 5FDP’s favorite bands, and for its fans in Florida. “5FDP is incredibly excited to be part of the kickoff of the World’s Loudest Month,” he said. 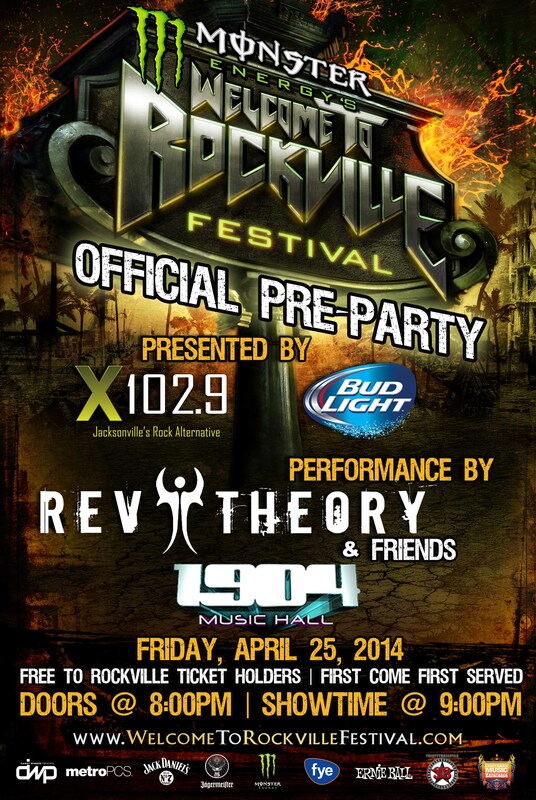 “Having already ‘rocked’ Rockville, this will be our first time bringing it to Fort Myers. 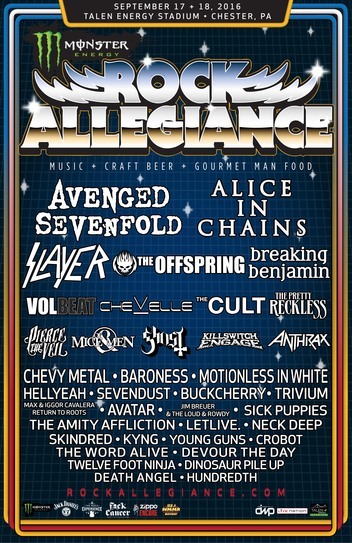 We are blessed to have so many fans in Florida that made it possible for the band to step up as a festival headliner standing beside giants like Korn and Rob Zombie! Thank you, Florida. See you all soon!” Festival co-producer Clay Bush of Danny Wimmer Presents shared the excitement of all of the bands in speaking about the festival celebrating its second year. “After a great first year, we couldn’t be more excited to return to JetBlue Park with an amazing band lineup and fantastic partners,” Bush said. Organizers are offering audiences a special limited time discounted ticket pre-sale from Tuesday, January 28th – Thursday, January 30th. During this short sale, a limited number of discounted general admission tickets will be available for purchase. Each day’s prices are listed below (plus fees). 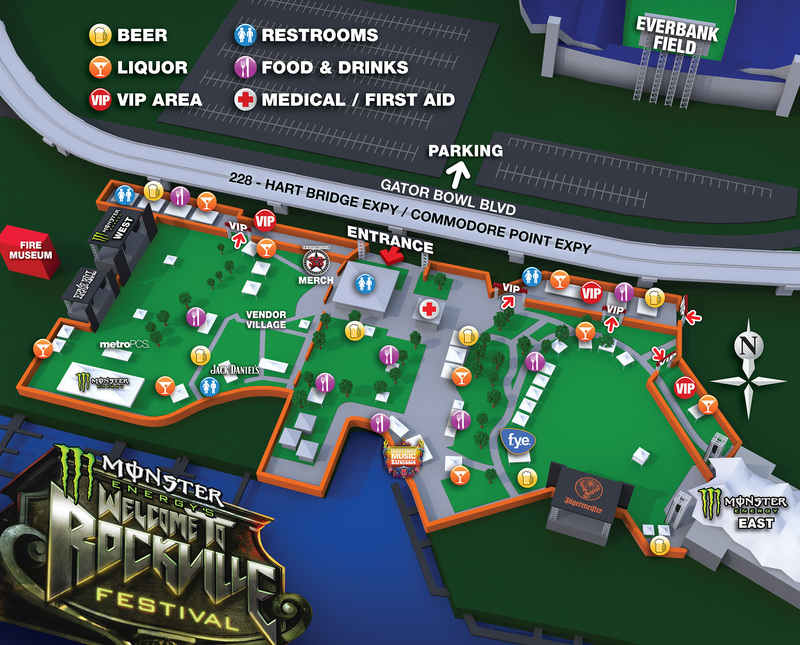 Passwords can be obtained for the pre-sale online at http://www.RevolverMag.com and http://www.FloridaWeekly.com. Regularly priced General Admission tickets will go on sale Friday, January 31st at 10a.m.ET at http://www.FortRockFestival.com and via all Ticketmaster outlets. General Admission tickets start at $49.50 and VIP tickets start at $99.50 each. Prices increase February 10th. Tickets can also be purchased at all Pita Pit locations for $50, with no service fees. A limited number of discounted General Admission tickets for the military will be available for just $29. They can be purchased online at http://www.govx.com. 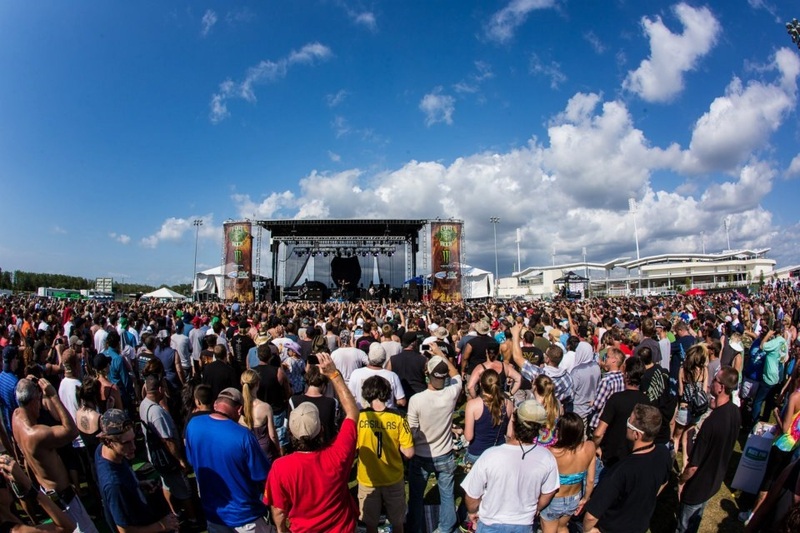 The Fort Rock Festival is the opening concert of a series of concert festivals produced by Danny Wimmer Presents and AEG Live. 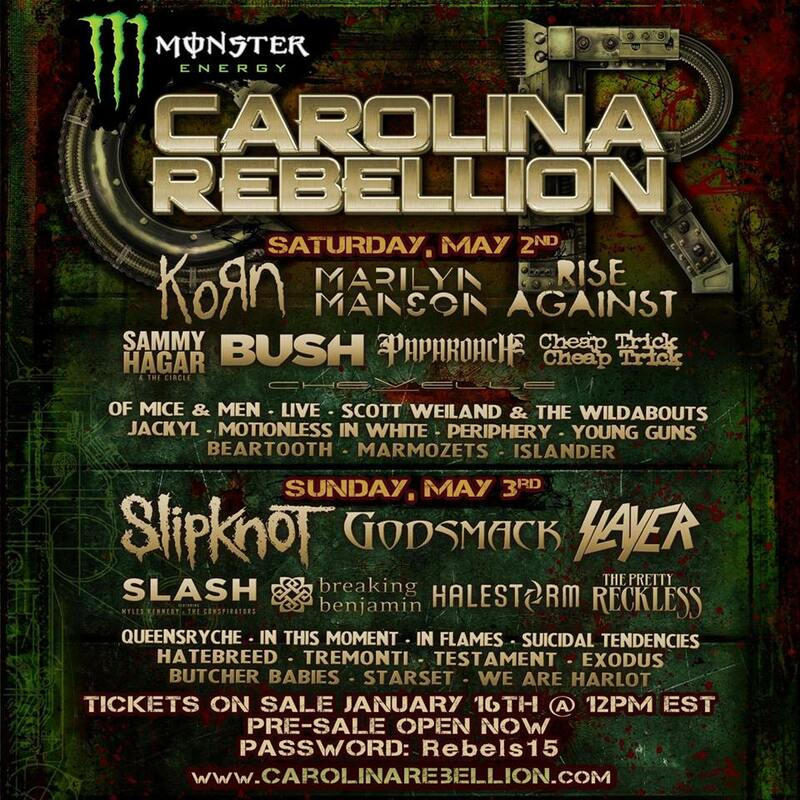 Also among that list of concerts presented by Danny Wimmer Presents and AEG Live is are: Rock on the Range and Carolina Rebellion. It is also part of the kickoff of the World’s Loudest Month and the Florida kickoff along with Monster Energy’s Welcome to Rockville. It is sponsored by Monster Energy, Jack Daniels, Jagermeister, and f.y.e. More information on the Fort Rock Festival is available online at http://www.FortRockFestival and http://www.facebook.com/fortrockfestival. To keep up with the latest sports and entertainment news and reviews, go online to http://www.facebook.com/philspicks and “Like” it. Fans can always keep up with the latest sports and entertainment news in the Phil’s Picks blog at https://philspicks.wordpress.com.